Service 79 operates hourly on Monday to Saturday daytimes. Monday to Friday 08:30 journey from Salford Shopping Centre to Swinton – ETM data shows an average of 0.83 passenger per trip will be affected by this change. Saturday 08:44 journey from Salford Shopping Centre to Swinton: ETM data shows an average of 0.95 passengers per trip will be affected. Saturday 17:16 journey from Stretford Mall to Irlams o’th’ Height: ETM data shows an average of 2.90 passengers per trip will be affected. Diamond currently provide one subsidised Saturday journey per week on this service, running a different route to the main commercial service provided by Arriva. 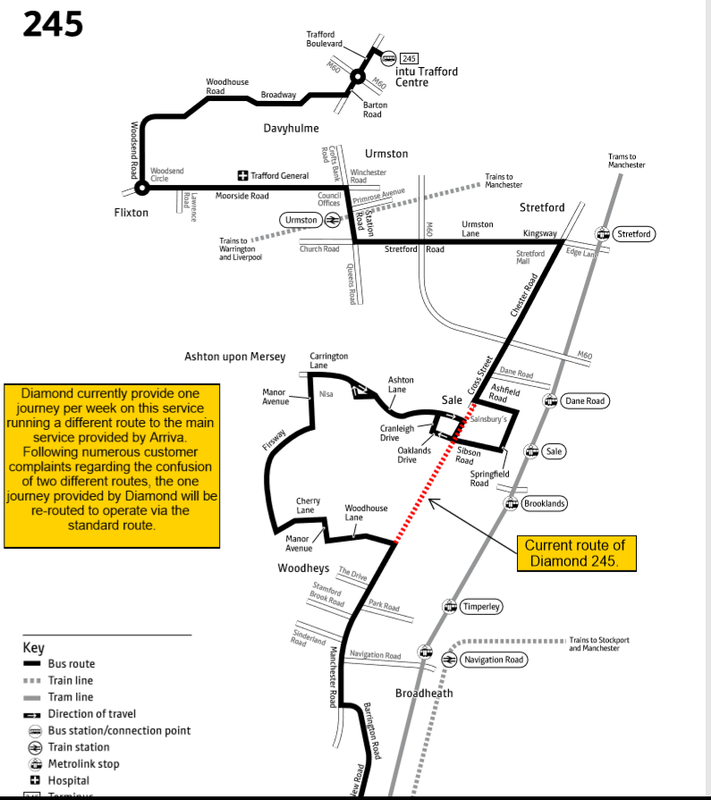 Following numerous customer complaints regarding the confusion of two different routes, the one journey provided by Diamond will be re-routed to operate via the standard route. The service would start in Stretford at 06:40 providing an earlier journey from Ashton into Altrincham and this one journey would not serve Flixton or Urmston, where usage is low – connections can be made from other services at Stretford. 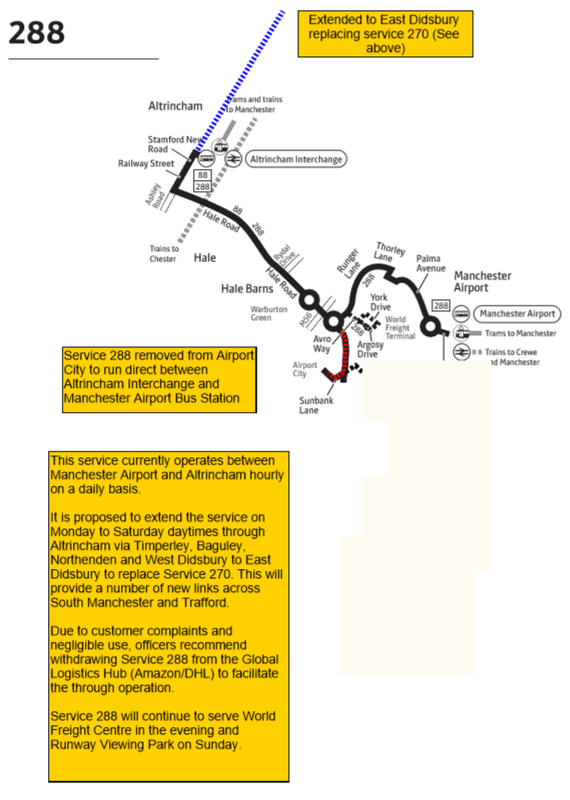 It is proposed that this service be replaced by the extension of existing Service 288 at Altrincham to provide a through service to Manchester Airport (see below). This service currently operates between Manchester Airport and Altrincham hourly on a daily basis. 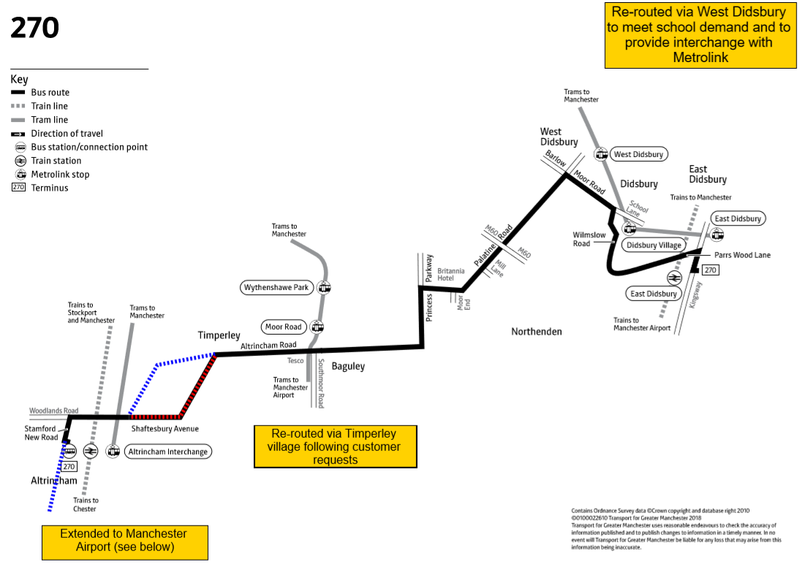 It is proposed to extend the service on Monday to Saturday daytimes through Altrincham via Timperley, Baguley, Northenden and West Didsbury to East Didsbury to replace Service 270. This will provide a number of new links across South Manchester and Trafford. Due to customer complaints and negligible use, officers recommend withdrawing Service 288 from the Global Logistics Hub (Amazon/DHL) to facilitate the through operation. Service 288 will continue to serve World Freight Centre in the evening and Runway Viewing Park on Sunday.